Years collaborating and exploring creative outlets result in a collection of tight, focused songs from folk artist Rose Cousins. 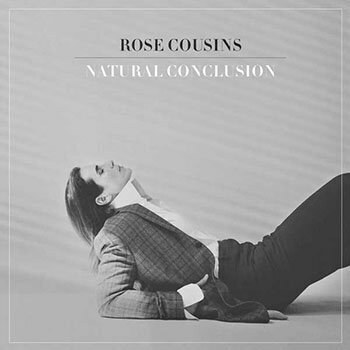 Five years following her last full-length album, Canadian-born singer-songwriter Rose Cousins returns with a haunting and jazz-tinged collection of self-reflective tracks in Natural Conclusion. Helmed by producer Joe Henry, whom Cousins met after the release of 2012’s We Have Made a Spark, this new album was recorded in Toronto, but brings together influences from Nashville, Los Angeles, Ireland, and her home of Nova Scotia. In interviews about this album, Cousins talked about the creative explorations she led in 2014 and 2015, searching and finding opportunities to photograph and write. Compiled into Natural Conclusion, those excursions resulted in strong and focused arrangements and accompaniments with Henry. Religious undertones of redemption and salvation pervade this album from the quiet opener in “Chosen” through the perseverance of a rocking “Chains". Relationships and pain flow through the tracks, too, and Cousins sings of strength and resolve to survive and endure despite loss or endings. “White Flag” admits defeat and Cousins gives away hearing and feelings with a strong vocal delivery of emphatic and emotionally devoted lyrics. The strongest lyrics about yearning for a lost relationship pour from Cousins voice in her performance in “The Grate". This song speaks of hearing and seeing the faintest glimpses of a shared moment or fading connection before a piano solo crashes and Cousins lyrics fade to her cries of “why?” Briefly, “My Friend” follows these slim hopes with further yearning, but it is a song that unnecessarily reiterates the importance of a relationship and seems out of place before the strong “Tender Is the Man". If any set of tracks define this album through their performances, lyrics, and arrangements, those are “Tender Is the Man” followed by “Lock and Key". Kicking off the second half of the album, “Tender Is the Man” generates a slow bluesy and country feel with a jazzy presence that was slowly growing in the first half of the album. But, it’s another brief track and Cousins moves into the jazz piano backed “Lock and Key", a track that focuses on that style and highlights Henry’s production presence profoundly. Cousins voice is the prominent feature in these two tracks and her emotional charge gives significant weight to the themes of human desire and vulnerability present on Natural Conclusion. The band Cousins and Henry collected for this album provide a strong musicianship and dignified performances that back up and protect her voice. Dummer Jay Bellerose gives each track a measured beat on drums, while bassist David Piltch equally generates a quiet backbone for the album on bass. Pianist Aaron Davis and guitarist Gord Tough compliment Cousins own piano and guitar work on the album, while Zachariah Hickman brings further bass and familiarity with Cousins after touring with her extensively. Pedal and lap steel guitar and dobro is performed by Asa Brosius, another touring partner of Cousins, and hose instruments elevate each song with an eerie presence that never wavers and leaves the listener searching for presence. Kinley Dowling, another Canadian native to Cousins hometown of Prince Edward Island, plays violin and viola, while Hickman and Cousins’ friends Jill Barber, Caroline Brookes, and Miranda Mullholland all give subdued backing vocals. True to Cousins intent, this is an impressive set of collaborators, and they back her up well on this album. Through the latter tracks on the album, such as “Grace” and the Ireland-influenced penultimate track “Donoughmore", you can start to wonder when the emotionally driven anguish and searching for resolution will reach the apex and turn to redemption, but only on “Coda” is there a hint of these influences turning over. It’s a beautiful album, and its quiet mood illustrates its author's reflective journey, equally offering that opportunity to its listener. Cousins is at home in a genre of singer-songwriters that provide entertaining, enjoyable records that additionally push for greater solace and weight in the music and messages they convey. If there is one criticism about Natural Conclusion, it is that the overall impact may not attract new audiences, even though it gives its listener a lot to digest in just 45 minutes.